Dreieich, Germany - MEDWEL, Inc., a Portwell subsidiary and leading medical solution provider announced the launch of a new medical Panel PC version MEDS-P1000. 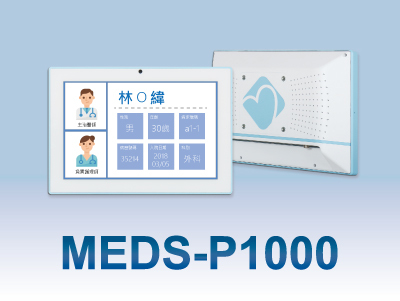 The new MEDS-P1000 is a 10.1" Panel PC based on the NXP™ i.MX6 quad core processor is suitable for use as a bedside healthcare infotainment terminal in hospital and medical equipment HMI (Human Machine Interface). It is equipped with peripheral including RFID, Wi-Fi and Bluetooth mainly for the nurse, doctor or patients’ family to check patients’ information and also serves as an HMI to be integrated within medical equipment. The terminal design lets medical personnel download and view medical information and data. The MEDS-P1000 panel PC supports up to 2GB DDR3 memory and can be equipped with 8GB eMMC, one HDMI, 2x USB ports and one COM port for RS-232 on rear I/O. Its compact design 274(W) x 213(H) x 38(D) mm; 11.8” (W) x 8.4” (H) x 1.5” (D), plus low power consumption and effective computing make the MEDS-P1000 a perfect HMI and bedside terminal solution. Android 6.0 support, PCAP multi-touch screen and extensive connectivity options for communication and peripheral devices are highlights of the MEDS-1000. The front of the plastic housing complies with IP65 and supports anti-disinfectant wiping, making the MEDS-1000 easy to clean and sterilize, thus reducing maintenance costs and contamination risks. The graceful mechanical design and advantageous performance—up to Quad Core Cortex®-A9 @1.0 GHz Freescale™ i.MX6 Family and tailor-made specification for medical terminal—make that MEDWEL MEDS-P1000 medical grade panel PC is a perfect and practical solution for medical applications.